Ted Carmichael Global Macro: Big Deficits, Bigger Debt: Who Cares? Big Deficits, Bigger Debt: Who Cares? Canadian governments are leaking out the bad fiscal news that comes along with slow growth and a collapse in commodity prices. The Government of Canada revealed that even before implementing the bulk of the Liberal government's spending promises made in the recent election, its projected fiscal deficit for 2016-17 has jumped to C$18.4 billion. Oil-rich Alberta's recently elected New Democratic Party Government has let slip that its projected deficit will rise to a record $10.4 billion. Newfoundland's recently elected Liberal Government has murmured that its deficit will rise to an unprecedented $2 billion (about 6% of provincial GDP). As the bad fiscal news trickles out, many prominent Canadian economists are arguing that more fiscal stimulus is needed. Some say that a $30 billion federal deficit would be appropriate, some say $40 billion, some even say $50 billion. They argue that Canada is in the enviable position, after almost 20 years of working down its federal government deficit and debt, of having plenty of room to add fiscal stimulus to boost an economy experiencing sluggish growth. Personally, I don't think that allowing fiscal automatic stabilizers to push up budget deficits is a bad thing. But I do think that urging governments to increase deficits by 2 or 3 percentage points of GDP for several years carries far more risk than these economists are letting on. While Canada's federal government has done a very good job of getting its' fiscal house in order over the past 20 years, Canada's total debt levels have increased dramatically over the same period. In 1995, Canada faced a government debt crisis. 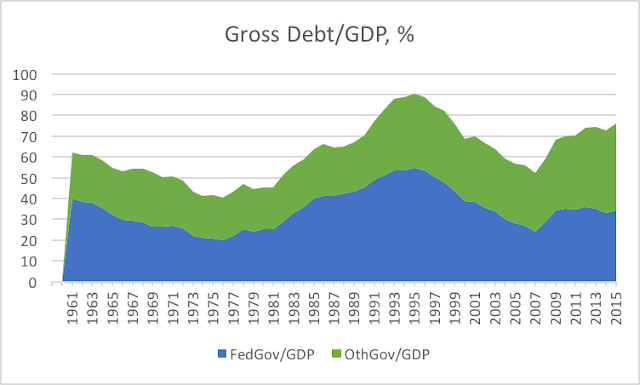 The combined gross debt of all levels of government reached 91% of GDP, with the federal government debt at 55% of GDP and other levels of government adding another 36%. At that time, Canada's total debt to GDP was 231%. In 2015, Canada's total debt has reached 312% of GDP. 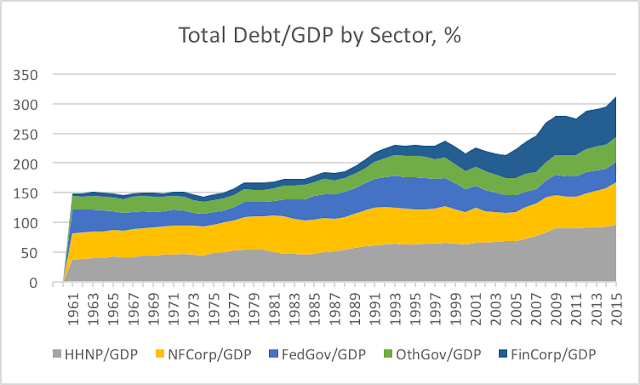 While federal debt has fallen from 55% to 34%, the debt levels of all other sectors have increased significantly. Over that period, household debt has risen from 63% to 95% of GDP; non-financial corporate debt has risen from 58% to 72% of GDP; financial sector debt has risen from 19% to 69% and debt of other levels of government has risen from 36% to 42%. Saying that Canada's federal government has plenty of room to borrow to add fiscal stimulus ignores the sharply increased debt levels of every other sector of the economy. Just looking at the government sector, it doesn't appear that the situation in 2015 is much better than it was in 1995. Total government debt at the end of 2015 was 76% of GDP, up 24 percentage points from the recent low of 52% in 2007. Over the past 55 years, only during Canada's government debt crisis period, which began in 1991, did total government debt exceed the level it reached in 2015. How Does Canada's Debt Compare? The world is awash in debt. How does Canada compare with other countries? In 2015, the McKinsey Global Institute published a revealing study titled Debt and (not much) deleveraging. 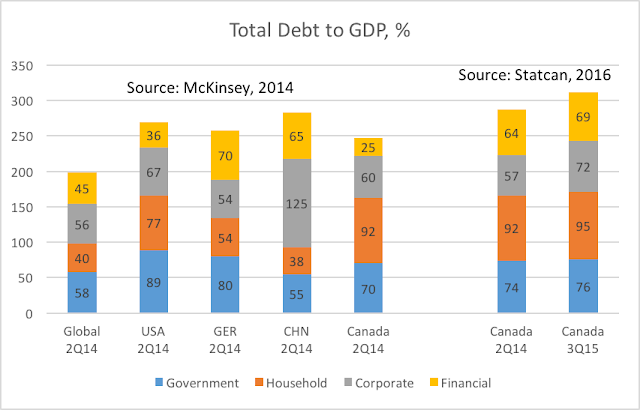 The chart below shows, on the left, McKinsey's breakdown of total debt to GDP in 2Q14 for the global economy, USA, Germany, China and Canada; and, on the right, Statistics Canada's breakdown for Canada in 2Q14 and the most recent data for 3Q15. The comparison shows that in the McKinsey study, Canada's total debt to GDP, at 247%, was significantly higher than the global average but slightly lower than Germany (258%), USA (267%), and China (269%). Statistics Canada data, from the National Balance Sheet Accounts, shows Canada's total debt to GDP was somewhat higher in 2Q14 than the McKinsey estimate, at 287%, mainly because of a higher estimate for the debt level of financial corporations. StatCan's measure of Canada's total debt to GDP for 2Q14 is higher than the McKinsey estimates for the USA, Germany or China, in large part because of the high level of household debt. StatCan's most up-to-date estimate shows Canada's total debt to GDP has surged to 312% in 2015, reflecting increases across all sectors, but with the biggest jump in the non-financial corporate sector. A good part of the increase in corporate debt was to fund expansion in the energy and other commodity sectors of the economy when commodity prices were high. Those economists who are encouraging the federal government to undertake stimulus to push the federal deficit up to $30 billion, $40 billion, or $50 billion are saying that the government has plenty of room to run bigger deficits. When the additional $20-30 billion deficits of the provincial governments are added, total government deficits could reach 3% to 4% of GDP over the next few years. This would push Canada's total government debt to GDP back above 80%, the level that marked the beginning of the government debt crisis of 1995. And it would come at a time when Canada's total debt to GDP was nearing 320%, compared with 230% in 1995. In the detail of the research, the authors report, "we see that public debt has a consistently significant negative impact on future growth. And, the impact is big: a 10 percentage point increase in the ratio of public debt to GDP is associated with a 17–18 basis point reduction in subsequent average annual growth [over the next 5 years]". In Canada's case, this suggests that the 24 percentage point rise in total government debt since 2007 could already be responsible for slowing real GDP growth by almost 0.5% per year. And the sharp rise in household and corporate debt is likely acting as a further drag on growth. Kenneth Rogoff and Stephanie Lo argue in in their 2014 BIS paper, that their leading candidate for the sluggish growth in the period since the financial crisis is the overhang of debt across all sectors of the economy. They argue that "these debt burdens need to be analysed in an integrative manner in order to assess the extent of an economy’s vulnerability to crisis or, in the case of advanced economies, the impact of higher debt on potential growth". They cite research that suggests "the impact of debt on growth in any given sector – whether it is government, household, or corporate – is worsened when other sectors also hold high debt. Therefore, an economy’s overall debt level and composition matter, both because private defaults can create contingent liabilities for the government and because there can be amplification mechanisms across sectors that exacerbate the negative effect of debt on growth. (For example, if private sector defaults lead to weaker growth, this affects the sustainability of government debt; if households are suffering debt problems, this can lower demand and can lead to strains in corporate debt)". We observe a poisonous combination – globally and in almost any one geographic area – between high and higher debt/ GDP and slow and slowing (both nominal and real) GDP growth, which stems from a two-way causality between leverage and GDP: on the one hand, slowing potential growth and falling inflation make it harder for policies to engineer a fall in the debt-to-GDP ratio, and on the other hand attempts to delever both the private sector (especially banks) and the public sector (through austerity measures) encounter headwinds, as they slow, if not compress, the denominator of the ratio (GDP). After the G20 meeting in Shanghai last week, Canada's new Finance Minister Bill Morneau said, "I received very positive feedback on Canada’s new path for long-term growth"... and added that the March 22 budget “will demonstrate Canada’s commitment to making smart and necessary investments in order to grow the economy." However, the Financial Times reported that G20 finance ministers clashed over the wisdom of additional fiscal stimulus. The FT quoted Wolfgang Schäuble, German finance minister, as saying from the sidelines the Shanghai meeting, "The debt-financed growth model has reached its limits. We therefore do not agree with a G20 fiscal package as some argue … There are no short-cuts that aren’t reforms." While many prominent Canadian economists have supported larger deficits, they do not seem to have considered the impact of bigger deficits on Canada's total debt to GDP and the consequences of record high total debt levels for medium and longer term growth. This is a particularly important at a time when Canada is facing the largest, most rapid and potential longest lasting deterioration in its terms of trade in decades -- itself a serious blow to Canada's GDP and it's capacity to support its' high level of total debt. In my opinion, this is an environment in which great caution is required in the formation of fiscal policy. In particular, fiscal measures that contribute to a lasting increase in structural budget deficits at either the federal or provincial level should be avoided. Government deficits will rise; automatic stabilizers should be allowed to work; some infrastructure spending that supports private sector growth should be undertaken, temporary tax incentives to encourage private sector investment could also have a positive short-term effect without increasing structural deficits. But large increases in federal and provincial government budget deficits -- at a time when the debt of other levels of government and the private sector are at record highs -- would pose a significant threat to Canada's longer-term economic growth and stability.